Kazakoff, E.R., Macaruso, P., & Hook, P.
U.S. Department of Education data continually indicate that students who are English Learners (ELs) underperform in reading compared to students who are not English Learners (non-ELs). This study examined whether a personalized, adaptive blended learning approach can support reading development in ELs and non-ELs. There were 442 ELs and 442 non-ELs matched on grade level, beginning-of-year aimsweb tier status, and placement level in the blended learning program (Lexia Core5 Reading ®). After 1 year, both groups showed significant gains on aimsweb with no differences between groups for kindergarten, and second through fifth grade. In first grade, students who are ELs outperformed students who are non-ELs. 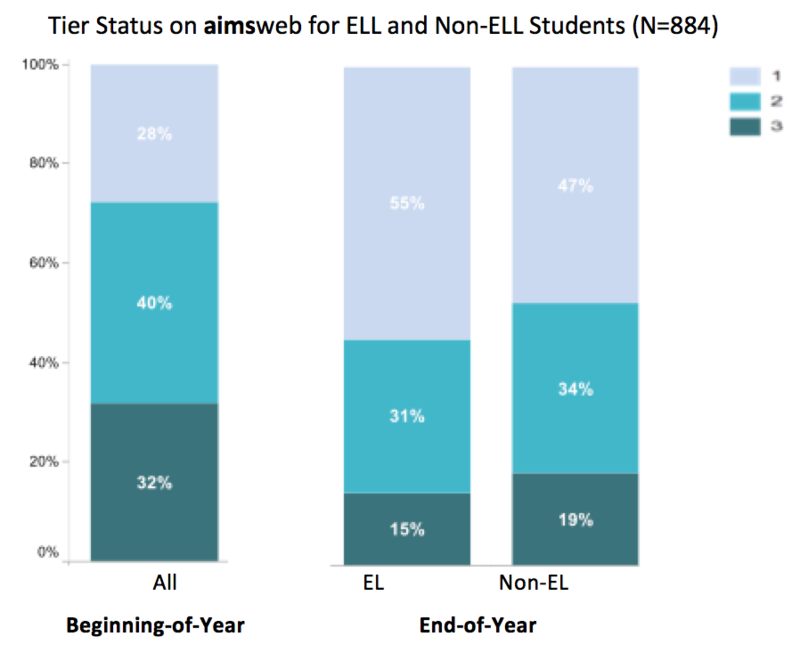 For students who continued the blended learning program for 2 years, ELs and non-ELs showed similar changes in aimsweb tier status. Notable reduction in the percentage of students identified as at-risk for reading failure was found in both the EL and non-EL groups. The percentage of EL and non-EL students in Tier 1 on aimsweb nearly doubled by the end of the first year, with approximately half of the students in both groups finishing the year in Tier 1. Nearly two-thirds of both EL and non-EL students who were in Tier 3 on aimsweb at the beginning of the first year improved one or more tiers by the end of the year, demonstrating substantial reading gains.